And after our post walk defrosting yesterday we went ice-skating: an infrequent event. Rented skates never fit: we are clumsy and make jokes: are proud of ourselves for venturing to fail. And after we take Ben to the first aid room (an off rink tumble: suspected stress fracture to the right radius) it's time to go home, where there's picture of Ben on Facebook. His arm is in plaster, and he's smiling. And this morning the warm bed is reluctantly quit. Fill the flask with coffee, fresh brewed. 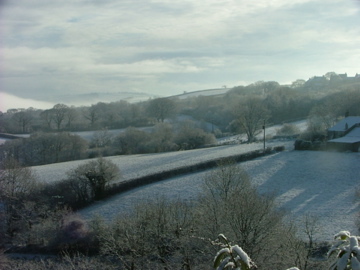 Admire the monochrome of snow on hills. We know the training hall floor will be cold. Shiver in the queue: everyone is cold together. 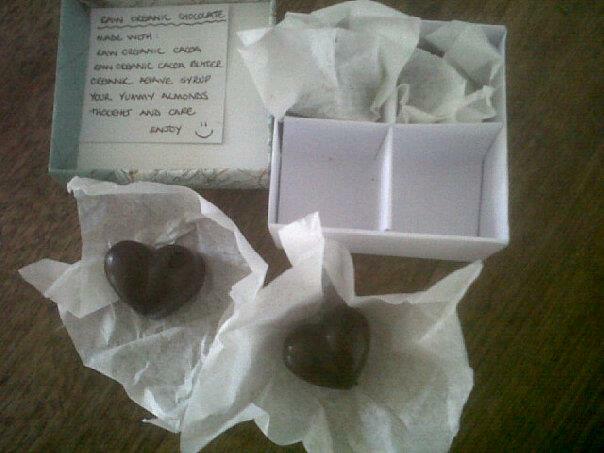 Not everyone has this though: a gifted handmade box of handcrafted chocolates. That's the picture I share to Facebook, today: you can't see me in it: you can guess I'm smiling. All the thoughtful shares add up. I'm always smiling. I think I picture you, Lils, either smiling or with a look of great concentration on your beautiful face -- depending on the task. Just had a bite of chocolate with almond. It was not, however, handcrafted with deep affection. Enjoy yours thoroughly and all the very best to Ben. Sounds like you had a wonderful day until the happy little accident occurred. Great post and I hope Ben gets well soon! Homemade chocolates and fractures! What a day. Your view is beautiful. Have you given this home a name yet? Something that evokes feelings as much as it does images? Good for you--ice skating! I've ventured out on cross country skis a couple of times, but then the snow melted. It is cold though. Bitter cold. How have you been?? Shaharizan: What a poetic name you have :-) It was a lovely day- Ben's recovery will be speeded by all these good wishes!